The end of a decades-old female driving ban is expected to bring an economic windfall for millions of Saudi women, making it easier for them to work and do business. Taghreed Ghazala, who owns a chain of beauty salons, sees the move as a huge step forward for businesswomen like her in the ultra-conservative kingdom. "I have many drivers that I pay to transport my employees around," she told AFP ahead of the end of the ban on Sunday. "Now I don't need them anymore. My business will save money, effort and time and I can invest them to grow my business faster." Saudi women are severely under-represented in the jobs market, with a staggering 31 percent unemployment rate among the female workforce. They make up just under 23 percent of the national workforce of six million, according to official figures—mainly because of their restricted mobility. 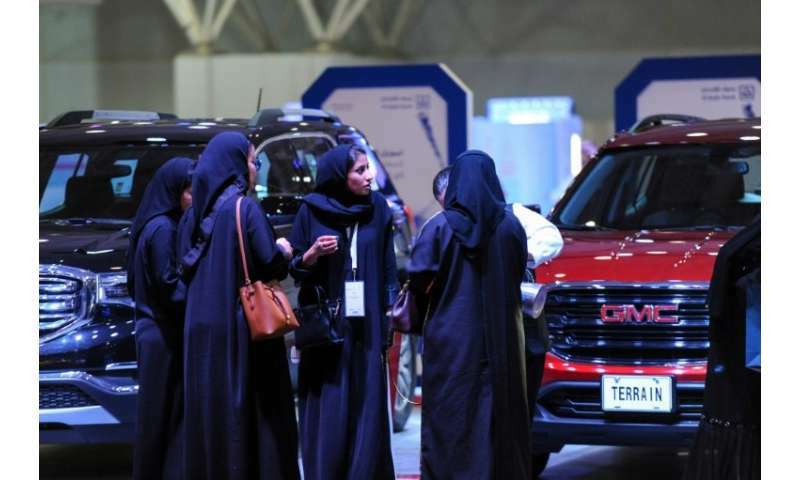 A recent survey by the Chamber of Commerce of the Red Sea city of Jeddah showed that transportation was considered one of the top barriers holding Saudi women back from joining the labour market. Experts expect that the lifting of the driving ban will not only help raise female participation and employment rates but also create new jobs. "I believe the decision will do more than just provide more job opportunities for women," said Ihsan Bu-Hulaiga, head of the Riyadh-based Joatha Business Development Consultants. "It will also boost the female economic participation rate and cut the overall national jobless rate because most of the unemployed are women and many of them are university graduates," Bu-Hulaiga told AFP. Saudi Arabia's "Vision 2030" reform programme, the brainchild of Crown Prince Mohammed bin Salman aimed at weaning the kingdom off its dependence on oil, seeks to boost women's representation in the Saudi workforce to 30 percent by 2030. Allowing women to drive is also expected to sharply boost both car and insurance sales but is likely to reduce the number of expatriates and increase traffic jams and demand for energy, analysts said. Dubai-based PWC Middle East Consultancy estimates that by 2020, the number of Saudi female drivers will reach three million, in addition to Saudi Arabia's 9.5 million male drivers. The kingdom has a population of 32 million people, including 12 million expatriates, according to official figures. Car sales are expected to grow by nine percent annually until 2025 as more women get behind the wheel, compared to three percent annual growth in the past four years, PWC said. The decision will also result in less spending on male drivers hired to chauffeur women—and potentially leave foreigners employed in those positions without work. "The decision will reduce the number of expatriate private (family) drivers which will positively impact the Saudi family budgets regarding drivers wages, housing and health insurance," Fadhl al-Buainain, a Saudi financial and banking consultant, told AFP. The move will also have an immediate impact on the daily lives of Saudi Arabia's working women. For more than 15 years, Raghda Bakhorji used to wait every morning for a driver to pick her up, and take her to the King Abdulaziz Center for World Culture in Dharan, where she works as a coordinator for an outreach program. "Being able to drive will be a transformative experience to my routine and lifestyle in general," says the young career woman. "In my case, driving will also probably let me save around 3,000 riyals ($800), on a monthly basis", she told AFP. Buainain, the consultant, said transportation costs consumed almost a quarter of employed women's earnings. Saudi Arabia spends more than 25 billion riyals ($6.7 billion) on the annual salaries of around 1.38 million foreign private drivers, according to official figures. In addition there are expenses for their entry and residence permits, housing and healthcare. But the decision could also have some negative impacts such as traffic jams caused by an increase in the number of vehicles on the roads, said Buainain. In February, the energy-dependent kingdom allowed women to open their own businesses without the consent of a husband or male relative, in a bid to expand a fast-growing private sector.